Live plants certainly add to the esthetic look of the bedroom and give it a lively spark. It is, of course, not their only merit. Naturally, we want our sleeping environment to be free these common stressors: clutter, noise, disturbing light and, of course air pollution. And that’s where the plants come in. Houseplants are famous for their toxin-busting and air-cleansing qualities, not to mention they help relax and calm the ever so restless minds, thus contributing to a night of sound sleep. 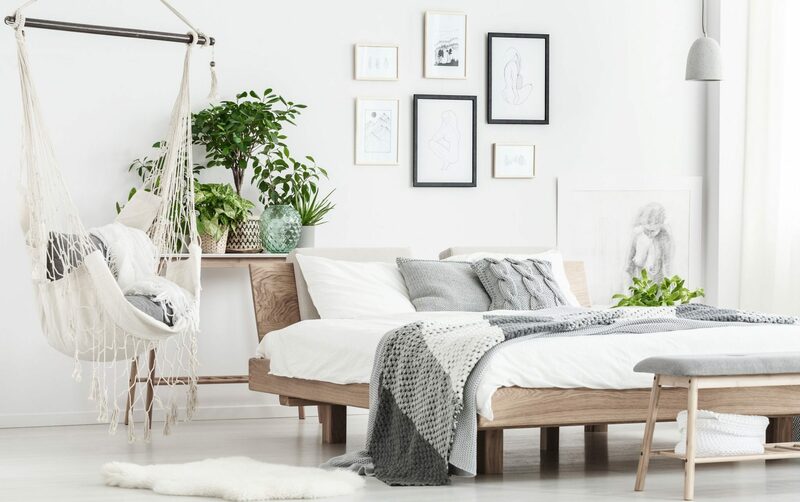 In this article I invite you to take a look at these indoor plants that, in my opinion, are the best picks for your bedroom. Meet the best green pal of people from various cultural backgrounds. 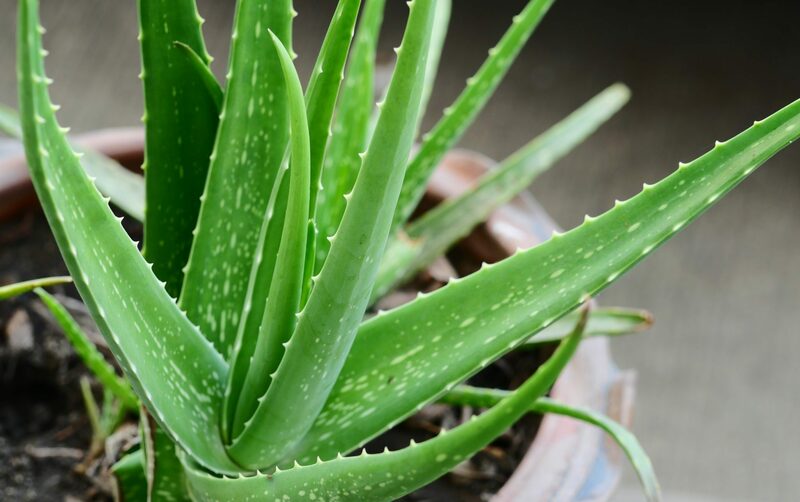 Indeed, in some countries aloe vera became somewhat iconic – because of its healing qualities it is largely used in cosmetics, perfume, meds and other personal care products. Aloe vera has the power to significantly reduce the content of toxic substances in the air. Here’s a vivid example: it absorbs up to 90% of the hazardous compound called formaldehyde that can be emitted by furniture products made with lacquers, paints and other coatings. At night the plant releases oxygen to contribute to your good night’s sleep and successfully absorbs carbon dioxide. The gel from its offsets is widely used for the treatment of burns, blisters, frostbites and other unpleasant skin conditions. It’s not too picky either, which is why it’s very easy to care for it. You don’t need to water it too often, all it really needs is the sunniest spot in your bedroom. People often buy lavender when they want to show their bedrooms and themselves some love. Because it is something that never fails to uplift the mood and make a person smile. 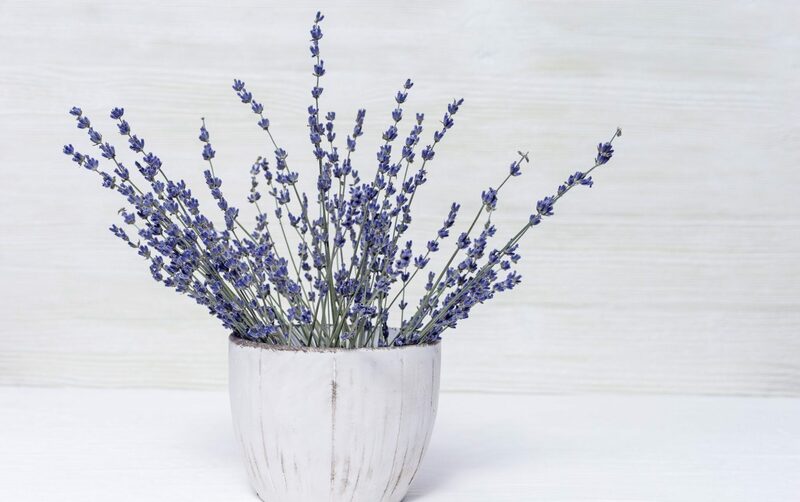 There are many different ways in which lavender can be used to promote good health and well-being: in a form of essential oils, perfume, soap, cute lavender sachets and more. However, it’s best to purchase a potted lavender plant and place it at the head of the bed. Its soothing color and otherworldly scent will contribute to restful slumbers and reduced anxiety levels. The charming plant is very easy to take care of, just try not to overwater it. Despite its somewhat daunting name, snake plant is well-known for its air-purifying qualities and is very good for bedroom. 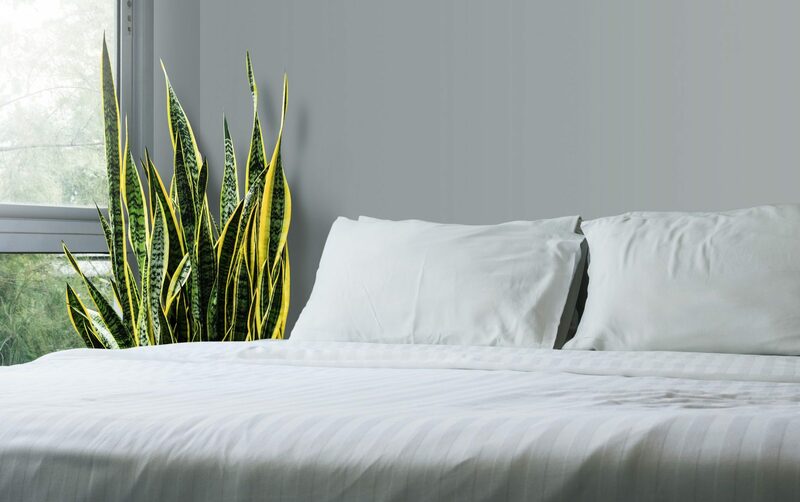 Unlike many small houseplants for the bedroom that devour oxygen during nighttime, snake plant, like no other, emits the oxygen at night, thus improving the quality of indoor air. This plant doesn’t need special care because of its West African genes. It’s what we can call a survivor, because it’s used to the harshest conditions and poor, infertile soil. Just like cacti or succulents snake plant needs to be watered every other week. One more tip: make sure that the pot where the plant lives has drainage holes to avoid standing water which can be fatal for it. If you look closer at a spider plant you would quickly see that its name does it justice. Its many baby pups that grow on the stems of the mother plant hold on to their pretend web just like spiders. 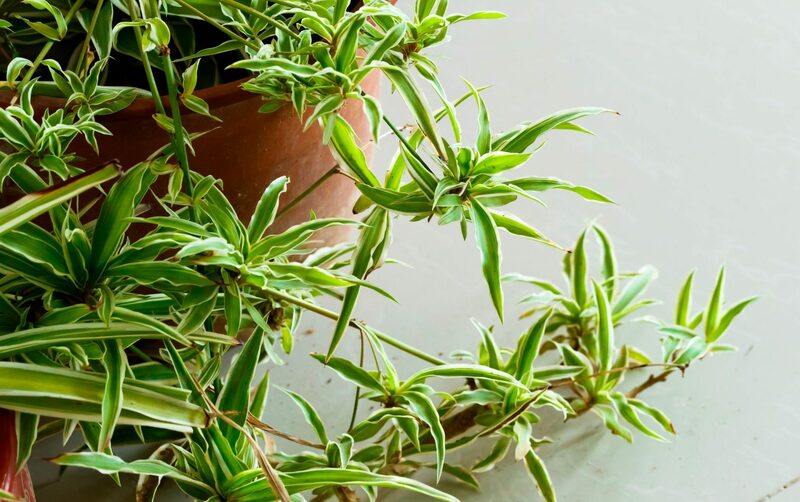 And just like spiders this plant serves its own purpose—the neutralization of toxic chemicals and air purification. It’s a great plant to keep in the bedroom since it makes the indoor air fresh and clean, hence creates perfect conditions for most sound zZz’s. And when we sleep well we wake up feeling refreshed and full of energy. It doesn’t require any special lighting—it grows well both in a sunlit room and on a shady side. The only thing you need to make a rule out of is to irrigate your plant with a settling water as opposed to a tap one. When you look at it you can’t help thinking that Gerber daisy is a friendly flower. There is something in the way it waves at you with its bright petals which immediately warms your heart. And its collection of vibrant blooms can easily bring joy to your nightstand. Though we can trace its origin to the South African soils it’s a fairly dainty flower. That's why, unfortunately, it won’t last long in a typical bedroom environment no matter how much you pamper or coddle your beauty. It’s grown under greenhouse conditions which can’t be recreated in a regular apartment. 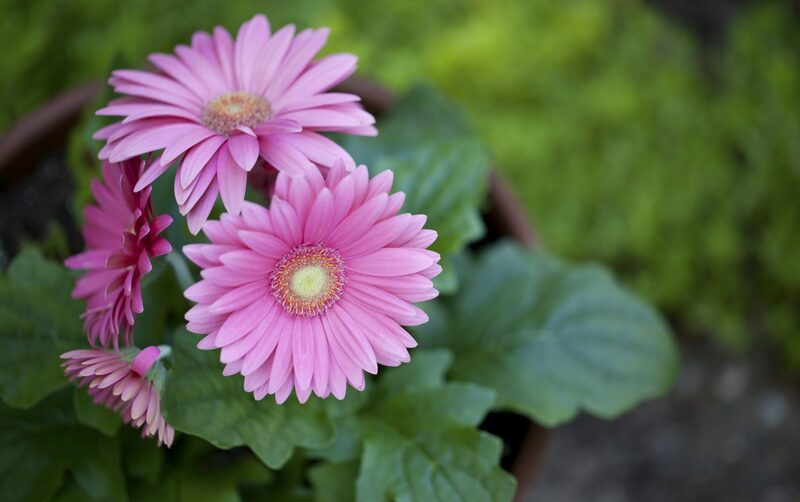 But it’s worth buying Gerber daisy anyway, because while it lasts it successfully removes organic pollutants and toxins from the air. Cactus has long become a widely admired heartthrob. It turned into a trend that went mainstream overnight. Now it’s anywhere you look: T-shirt prints, gift magnets, pottery and what not. Why hide it – it’s friendly, funny-looking and easy to fall in love with. Whoever would have thought that this thorny cutie is one of the nature’s best organic air purifier and a wellspring of healing and soothing properties. It consumes the energy from our surroundings to radiate it at full power. Cacti absorb carbon dioxide when we sleep and release oxygen to contribute to the quality of our sleep. They fight bad bacteria and significantly reduce harmful air ionization protecting us from irradiation, including the one emitted from TVs and computers. That is why it’s largely recommended to keep cacti near the said devices or place them in the office. 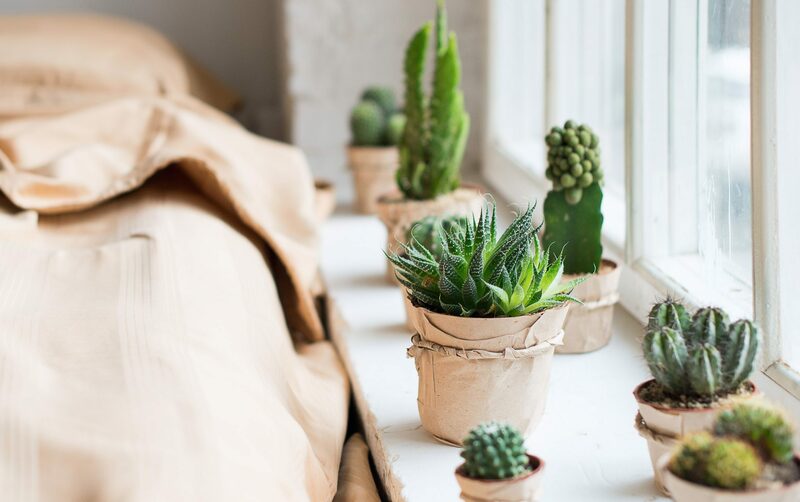 Cactus plants require plenty of natural light and heat, so make sure your bedroom is on a sunny side. TIP: Carefully select the pots for your plants. This way you can add a splash of color missing from your bedroom. Or, on the contrary, choose colors that harmoniously blend with the surroundings. Plants with their air purifying qualities are welcome guests for any bedroom. However, it’s best not to overdo it with greenery converting it into urban jungle. Three or five shy growers are more than enough to make your bedroom area a place to be. These many green pals are quite sufficient for fighting indoor air pollution and cleansing the indoor air from gases and chemicals. Also, it’s better to place the plants one or two meters away from the bed. Otherwise, their active energy might disturb the serenity of our sleep. Having few plants can be truly beneficial unless, of course, you happily nod off amidst a ‘rain forest’ and sleep like a baby anyway. In this case, don’t change a thing, because it’s working.